"Welcome to the Xendrik Mansion. This part of the house has been opened up to the public as a part of the city tour. Be careful not to touch anything. Everything here is steeped in family history. But before we get to the heirlooms, let’s get to know the family first. To your left is the Great Book of the Xendriks." "The Xendriks are one of the oldest surviving aristocratic families of the Lost Desert. The Xendrik Mansion, as we know it today, was built by Qahaar Xendrik II on the site of an old palatial home that belonged to the same family. The current master of the mansion is Aymas Xendrik, the great grandson of Qahaar, who is also the Warden of the Lost Desert. As the Warden, Aymas maintains close cordial relations with both the royal families of Sakhmet and Qasala." Qahaar Xendrik II was the nephew of Narmeer Xendrik. It was during Narmeer’s time that the family fell on hard times. The Xendriks lost the goodwill they enjoyed in the land and their relationship with the royal families too came under the scanner. 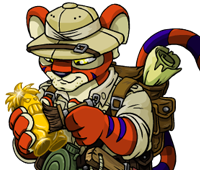 Traditionally, the Xendriks had always been entrusted with the responsibility of maintaining law and order in Sakhmet but due to many discrepancies getting uncovered in reports and speculations of the main officers being corrupt, discord sprang up in the city. The locals demanded the ouster of the corrupt officials. Narmeer’s popularity with the people was marred by his inaction on the matter, leading to a rebellion. Eventually, it was his nephew, Qahaar, who crushed the rising discord by convincing his uncle to step down and firing his council members. Qahaar became the first Xendrik to be made the Warden of the Lost Desert. Ever since, his line of the family has continued to oversee the safety and security of the people of the desert." The guide adjusts his glasses again and takes a quick sip of water from his bottle before continuing. The current family residing in the Xendrik Mansion is headed by Aymas Xendrik. 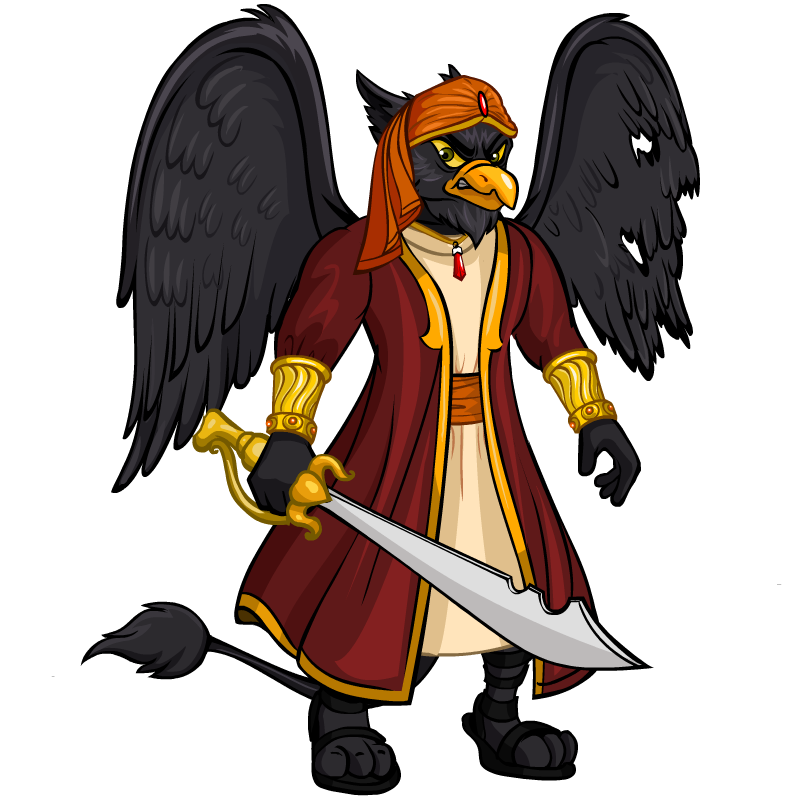 Aymas was a fearsome warrior in his prime and was renowned for his battle techniques all around Neopia. Early in his life as a warrior, Xendrik lost half of his left wing in battle. What would have been a deterrent for most was turned on its head by the indomitable Aymas who has been known to be even more formidable post the accident. Apart from being exceptionally skillful on the battle field, Aymas is also known for his sharp acumen and cunning, making him one of the most successful Xendriks of all times. Aymas’s wife, Leila, is a descendant of the Naharoo family of Qasala. She is a woman of few words and likes to keep to herself. Aymas and Leila are succeeded by their daughter, Lyra, who is training to be a warrior." "And now, the thing that we have been waiting for all along: the heirlooms. The most famous one of them is the scimitar. Let’s read the plaque underneath it. Among other things, Aymas inherited the great Xendrik scimitar which has been in the family for many generations. The exact origins of the sword are debatable and so is the name of the Xendrik who first wielded it. It is said to be made of foreign steel and is rumored to cut through stone. After Aymas inherited it, it has occupied a place of pride in the mansion as a prized family heirloom. The sapphire ring is the other prized heirloom of the Xendrik family. This too has been in the family for many generations. The ring is made of a large uncut sapphire which is set in a band of pure white gold. Legend has it that the precious stone was recovered from the depths of the sea in the north especially to be made into a ring for the Xendrik family. This concludes the tour of the Xendrik Mansion. Those who want to continue with the tour of the Lost Desert should regroup outside."